Maintaining reduction of the scapholunate interval after reconstruction can be difficult. 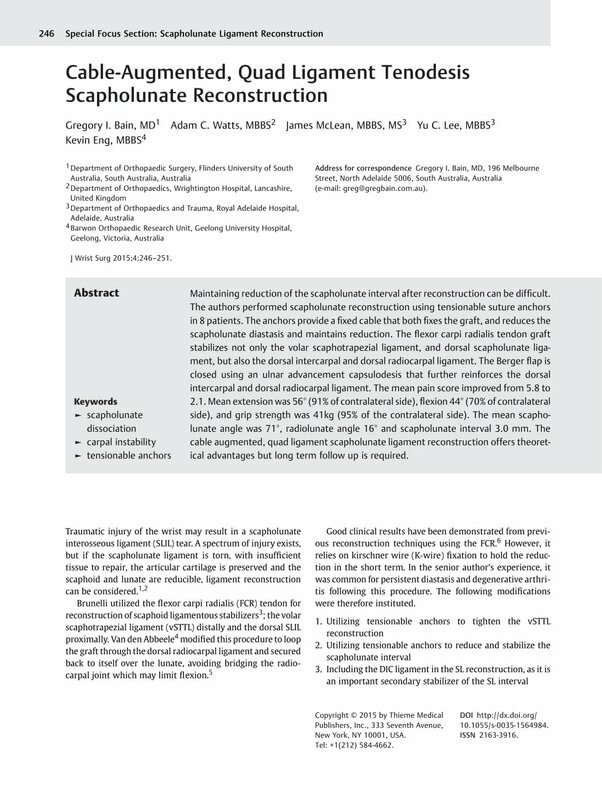 The authors performed scapholunate reconstruction using tensionable suture anchors in 8 patients. The anchors provide a fixed cable that both fixes the graft, and reduces the scapholunate diastasis and maintains reduction. The flexor carpi radialis tendon graft stabilizes not only the volar scaphotrapezial ligament, and dorsal scapholunate ligament, but also the dorsal intercarpal and dorsal radiocarpal ligament. The Berger flap is closed using an ulnar advancement capsulodesis that further reinforces the dorsal intercarpal and dorsal radiocarpal ligament. The mean pain score improved from 5.8 to 2.1. Mean extension was 56° (91% of contralateral side), flexion 44° (70% of contralateral side), and grip strength was 41kg (95% of the contralateral side). The mean scapholunate angle was 71°, radiolunate angle 16° and scapholunate interval 3.0 mm. The cable augmented, quad ligament scapholunate ligament reconstruction offers theoretical advantages but long term follow up is required. 10 Viegas SF. The dorsal ligaments of the wrist. Hand Clin 2001; 17 (1) 65-75, vi vi.